According to the most recent Nielson report, 49.7 percent of U.S. Mobile subscribers now own a smartphone, an increase of 38 percent over last year. The trend is continuing to grow as more than two-thirds of those who acquired a new mobile device in the last three months chose a smartphone over a feature phone. 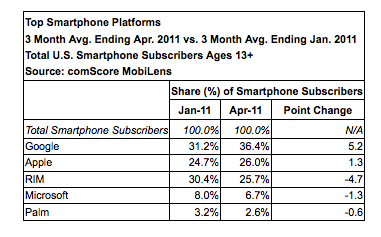 In the U.S. Android continues to lead the way with a 48 percent market share, Apple has a 32 percent share, Rim follows with 12 percent, with everyone else making up the remaining 8 percent. If you would like to get additional information check the full Nielsen report. If you like this article, please share it with your friends and contacts on Google Plus, Facebook, Reddit and Twitter using the following buttons so that they can also enjoy the article. According to a recent comScore report iOS drives more web traffic despite smaller installed base. 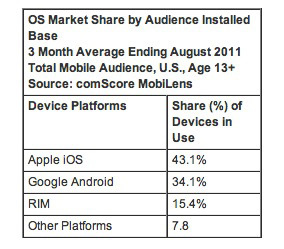 Although the Android Platform has the largest OS market share by installed base, 43.7 percent in August. The iOS platform had the highest share of mobile connected devices 43.1 percent compared to Androids 34.1 percent. The difference is largely attributed to the iPads dominance in the tablet market. “The iOS platform also accounts for the largest share of Internet traffic, measured in terms of browser-based page views, in the U.S. at present. When measuring market share of Internet traffic by platform, iOS accounted for more than half (58.5 percent) of the share of total non-computer traffic in the U.S.